Below are resources to help educators and students explore health equity and deepen understanding of series concepts. These lesson plans, syllabi, facilitation guides and online courses draw upon the UNNATURAL CAUSES series, this Web site, and carefully selected resources. Please share any lesson plans or activities that you have developed using the series or this Web site. How should limited public resources be deployed to tackle inequities in health? This lesson plan uses a real health crisis in the Marshall Islands and a parliamentary simulation to help students assess the strengths and weaknesses of different health promotion policies. By the end of this activity, students will be able to argue and defend different approaches to tackling the root causes of health inequities and will better understand how the making of social policy is often influenced by political and economic factors that may have little to do with the merits of the proposals themselves. These lesson plans use the series and the examination of primary source documents to guide students in understanding the social, economic, and political contexts of two epidemics in American history: pellagra and Type II diabetes. In six activities, students reflect on their own conceptions about the factors that influence health and longevity, learn about the socioeconomic conditions in the post-bellum South that led to the pellagra epidemic of the early 1900's, propose legislative solutions to the crisis, and finally use what they have learned about pellagra to inform their understanding of the Type II diabetes epidemic among the Pima and Tohono O’odham Indians of southern Arizona today. Students investigate their own neighborhoods and gain practice in research and analysis while drawing connections between health and a neighborhood's physical, social, service, and economic environments. This comprehensive guide was designed by the Boston Public Health Commission to accompany the the Unnatural Causes documentary series. The Guide can be used in both after school and in-school time settings. It is currently being integrated into civics, health, social studies, history, and science courses in many of Boston's public schools. KQED-TV has developed lesson plans for use with ESL/ESOL students, using clips from UNNATURAL CAUSES and other media to broaden students' understanding of factors affecting health. Other ESL lesson plans by KQED explore health literacy, the social contexts of drug and alcohol addiction, stress management, and cultural differences in medical practice. Roots of Health Inequity, is a new web-based course designed for the public health workforce. The site offers a starting place for those who want to address systemic differences in health and wellness that are actionable, unfair, and unjust. Based on a social justice framework, the 5-unit course is a conceptual introduction to ground public health practitioners in concepts and strategies for taking action in everyday practice. Continuing Education credits are offered for unit 1. Daniel Goldberg teaches a course at the Brody School of Medicine that aims to answer such questions as: What causes disease across the globe? What causes people in some parts of the world to have much higher rates of certain diseases than others? And what are the implications for global health policy and ethics? Dr. Bezruchka teaches a class introducing publich health graduate students to concepts of health equity and the social determinants of health. As a dissemination activity, the students organize a screening of UNNATURAL CAUSES for an outside group and lead a discussion. 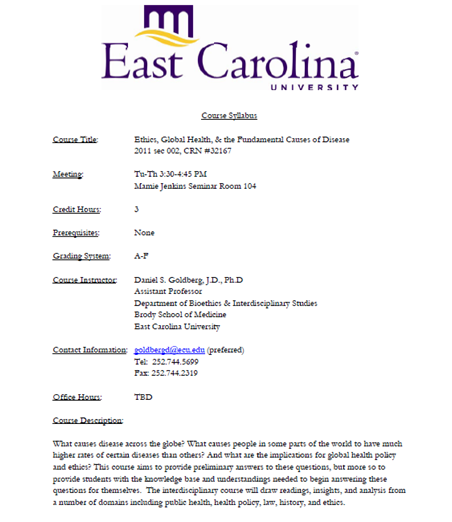 The course syllabus and other materials are available online. Primarily intended for WHO/PAHO staff and health ministry officials, this course (available in English, Spanish, and Portuguese) aims to raise awareness of and provide insight into the Social Determinants of Health (SDH) in order to reduce health inequities, encourage changes in the political agenda and contribute to a better administration of social justice and enforcement of human rights. The authors wish to inspire a critical vision of SDH by facilitating both the dissemination of the approach and the understanding of the intervention criteria, drawing on validated scientific papers on SDH, public policies based on the SDH approach, and documents produced by the Commission on the Social Determinants of Health. Web-based training series for public health practitioners and advocates interested in policy advocacy, community change, and multi-sector engagement to achieve health equity. 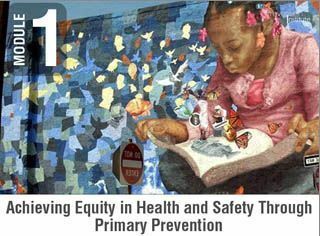 The Primer helps practitioners integrate a health equity lens into their initiatives in pursuit of overall health and safety. NOTE: Some of these resources were developed by outside groups. While we encourage organizations to adapt our materials for their own needs, California Newsreel does not endorse or assume responsibility for the views expressed or content provided on linked sites. 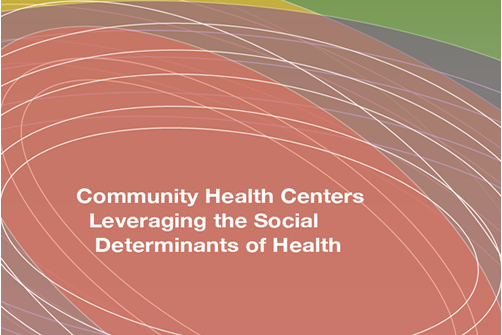 A report providing leaders in community health centers, public health and policy an understanding of how health care providers can move beyond health care services alone to improve the health of the population by leveraging social determinants of health. This guide includes a wide range of questions and activities to engage many types of audiences in dialogue—from community members to elected officials. General prompts address the series' overall themes and key concepts, with ideas for sparking discussion before and after viewing, deepening comprehension, and turning the viewers' focus to opportunities for action in their community. Episode-specific prompts introduce the key themes presented in each episode, check for and deepened comprehension, and spark discussion around presented issues and how they may apply to their community. The guide also suggests activities to delve more deeply into key concepts, highlights features on the series' companion website, and lists additional sources for further information. 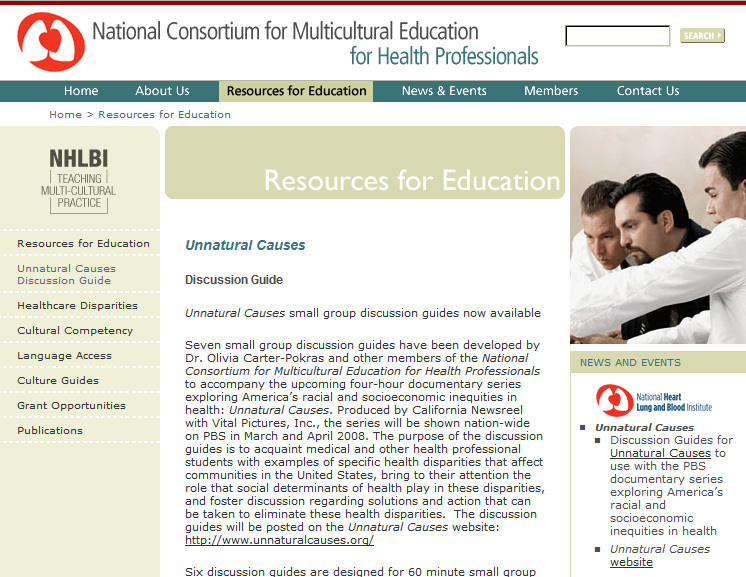 These seven small group discussion guides for use with the UNNATURAL CAUSES series acquaint medical and other health professional students with examples of specific health disparities that affect communities in the United States, bring attention to the role that social determinants of health play in these disparities, and foster discussion regarding solutions and action that can be taken to eliminate these health disparities. Chapter start time, end time, and length for all the episodes, along with the corresponding DVD chapter numbers. Linn Gould of Just Health Action – working with members of the Population Health Forum at the University of Washington – has developed questions for use with UNNATURAL CAUSES based upon a facilitation method created by the Institute for Cultural Affairs. Questions were generated and tested by the Population Health Forum and are available at their Web site. 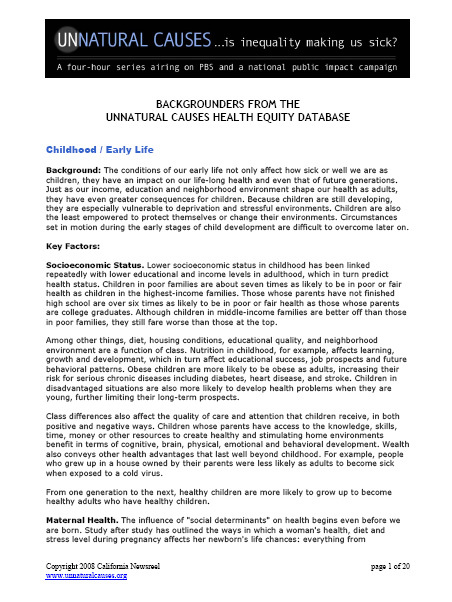 The full Health Equity Quiz in a 6-page PDF - 22 questions, with more detailed answers and references. Click here to access the quiz as an online, interactive activity. Special thanks to Stephen Bezruchka at the University of Washington Population Health Forum for his help in writing questions and inspiring this activity. Lesson plans and other materials about the Pima's struggle to regain their water rights, and the landmark settlement in 2004. Public Health Advocacy Curriculum: This ten-lesson curriculum combines classroom- and community-based activities to teach students about the upstream or root causes of health, and to encourage them to become health advocates. What is this thing we call 'race'? Where did the idea come from? What are the patterns of human variation? And if race isn't biological, what is it? How do our social institutions 'make' race? Used widely in classrooms and community spaces, This acclaimed three-part series compels viewers to scrutinize some of their most fundamental beliefs. Also see the extensive companion Web site, with games, interactivities, and additional information. This film is part of the Structural Racism sub-category of California Newsreel's African American Perspectives Collection. These slides by David R. Williams, Norman Professor of Public Health, Harvard University, demonstrate evidence of the pathways by which racism, especially residential segregation, shapes health outcomes. This handout describes several key resources that may be useful for audiences interested in learning more about the connections between population health and the built / physical, social, economic, and service environment. This PowerPoint file contains 36 of the more important graphs from the Equity Trust web site and/or published in The Spirit Level, illustrating the relationship between levels of economic inequality within countries and health and social problems. They can be downloaded and used in presentations as long as you acknowledge The Equality Trust as their source.